Capiz (Kapis) shell windows and doors were originally used in the Philippines. Traditionally the Capiz shells provided a cheaper alternative to glass and were durable enough to withstand the typhoon rains and winds. 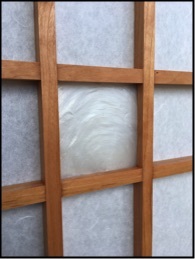 Similar to the Japanese Shoji screen the Capiz shell are light weight sliding panels and are translucent to allow light to pass through, but still allowing privacy. The Capiz comes from the windowpane oyster (placuna placenta) found in the coastal waters of the Philippines and are known for their beautiful mother of pearl look. 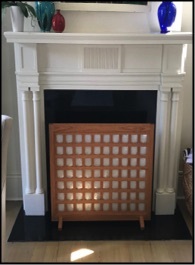 The Capiz shell panels I am building is my interpretation of the traditional Capiz panel from the Philippines and will only be offered for interior purposes only such as covering windows, closets, room partitions, pocket doors, or hinged free-standing screens. Similar to the shoji panel construction, the Capiz are constructed in such a way that if an accident was to happen and a shell is damaged it would be easy to repair with a new shell. When being used for window coverings the panels will have a Japanese synthetic shoji paper backing which will allow the light to pass, but helps protect and limit the shells exposure to Sun’s U.V. rays. The Capiz wood frames (stiles and rails) traditionally are much wider then the narrow shoji screen frames. In order for me to custom build to fit an existing open there will be variations in the frames sizes in order to accommodate the proper grill (lattice) spacing of the square shells. The Capiz grill design (lattice) is a symmetric design. The spacing and rows of shells is variable and sometimes determined by what will fit best within your opening. 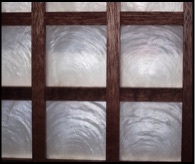 For a more artistic and unique design option one can incorporate some of the elements of the Japanese Shoji panel’s grill designs and create a Capiz/Shoji fusion panel combining the Capiz shells and Shoji paper. All woods are finished by hand with clear oil and wax. Unless otherwise specified, All Capiz panels will include a flush mortised ebony finger pull from Japan. 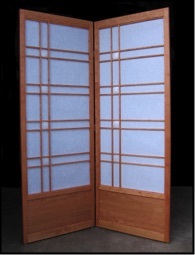 On larger door size panels, a section or multiple sections of solid wood similar to the Japanese Shoji lower kick-board is a practical and aesthetic option.